Just a portion of the Whitney Western Art Museum. I can’t take my eyes off her. I try to look at the wild dog on her right or the young warrior on her left, but my gaze always returns to her solemn face. She never looks at me, and she never will. With every stroke of his brush, the artist has made it clear that she’s only looking ahead. The rest of her tribe—from the baby on her back to the others on horseback trailing behind her—are counting on her to get them to their next camp. Meanwhile, I can’t even move on to the next painting, and the museum is closing soon. Was it really three hours ago that I pulled into the parking lot of the Buffalo Bill Center of the West in downtown Cody? Somehow, when I crossed the threshold I totally forgot about the clock. And time was a luxury I didn’t have. My art history term paper was due in two weeks and I had yet to even pick a topic. Fortunately, my professor pointed me in the direction of the Whitney Western Art Museum, one of the Center’s five museums, and arguably home to one of the finest western art collections in the country. “Mom, can I make a postcard?” a little girl asked as I walked in and wondered where to begin in the overwhelming expanse of the museum’s main room. The girl was at a high table in a corner where I could see postcard cutouts and a coloring station. Somehow I had gone from that carefree kid coloring with crayons to a stressed-out college student writing a 5,000-word term paper. Although I have to admit, being in the museum gave me a sense of peace—pure irony considering that much of the artwork here portrays the hard, and often violent, way of life synonymous with the American West. The western paintings surrounding me featured different artists’ signatures, but the storylines were similar. There were cowboys moving cattle, American Indians hunting bison, horses grazing on the prairie, and as the years went by, more covered wagon trains making their way westward. 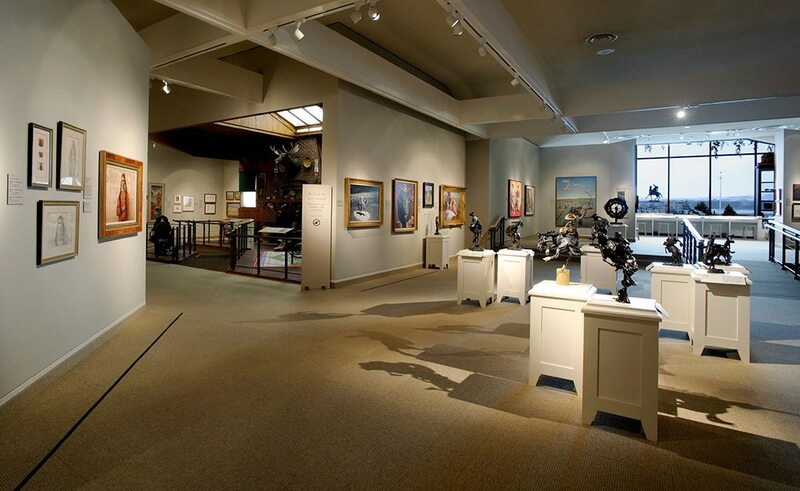 The museum’s Frederic Remington wing features a life-size rendition of his spacious New Rochelle, New York, studio, complete with authentic artifacts, reminding me that in the 1800s, the majority of the U.S. population—even the western artists whose work I was admiring—lived east of the Mississippi. Frederic Remington studio reproduction in the Whitney Western Art Museum. I briefly thought about focusing on Remington as the topic of my term paper. His studio seemed so real that the brushes on his easel looked damp with paint. I was tempted to finish where he had left off, but the interactive kiosks in the corner distracted me. The stations feature computers, at which visitors create their own masterpieces by overlaying pioneers, animals, trees, and more on top of Whitney gallery backgrounds. I mixed and matched for 15 minutes, but I was never able to turn the natural grandeur into a narrative in the same way that made Remington and his contemporaries household names back in the day. As I surveyed the room, the gallery’s open layout allowed me to see straight through the expanse of the Whitney, from the entrance all the way to the other end where giant windows looked out at the foothills of the Absarokas. There, museum-goers relax, watch videos by and about various artists, or sketch wildlife passing by the Center. The museum offered plenty to capture my attention, but Russell’s canvases had me riveted. Immediately, I gravitated toward a particular watercolor. It wasn’t the brightest or biggest painting in the room. In fact, it took me a moment before I realized what set it apart: It was the woman. 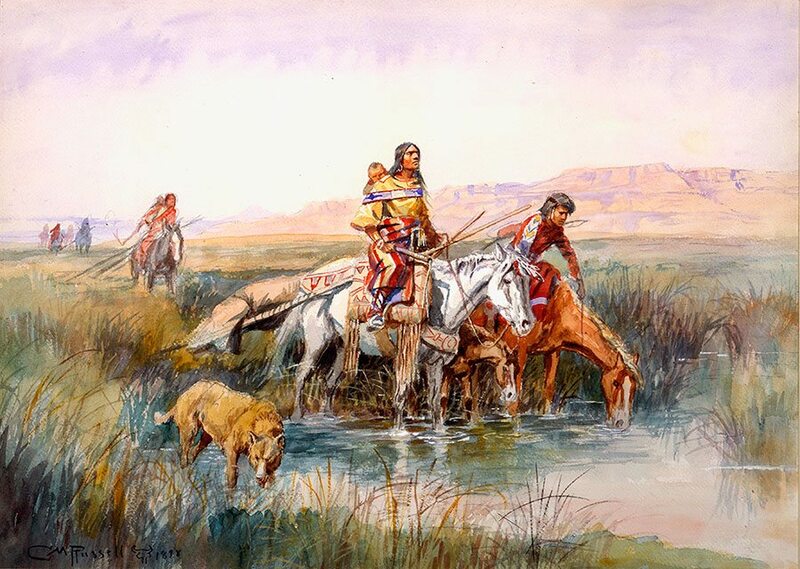 At first glance, I noticed a group of American Indians crossing a stream, but as I looked closer, I saw a woman leading the way. Finished in 1898, Russell’s Indian Women Moving Camp was distinct from the other western art I had seen thus far. Unlike many of his contemporaries who seldom painted women, Russell had chosen to make the subject of this painting a woman who was obviously a leader. She had a child strapped to her back as she sat on the tallest horse. Courage exuded from each brush stroke. Heroines on horseback. Females of the frontier. Women in the American West. I knew I had found the topic of my term paper. All that remained was to make an appointment with the Center to use their on-site research facilities in the McCracken Research Library. I’d still have to come up with 5,000 words, but I had a hunch this would turn out to be a very fulfilling assignment, and hopefully, an A+. 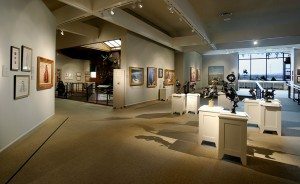 Explore the Whitney Western Art Museum’s online collection and plan a trip to the Buffalo Bill Center of the West.